Cuba’s celebrated 1980s Generation of artists includes some of the most accomplished and best-known Cuban-American painters: José Bedia, Tomás Sanchez and Humberto Castro. Drawing on his Cuban roots, Castro’s work often uses classical mythology as a parallel to the repressive regime in his homeland. 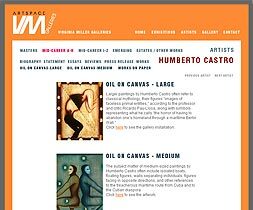 Castro’s second solo show at ArtSpace/Virginia Miller Galleries will be in October 2008.